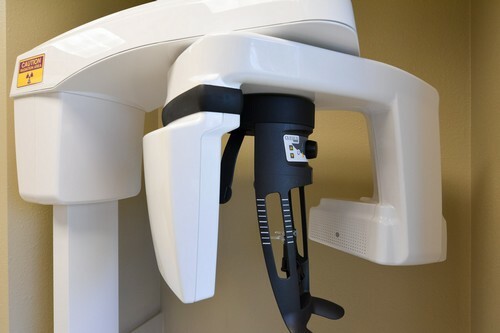 In keeping up with the latest and most advanced technology that is available in Dentistry, we are pleased to announce the installation of a small-field, high-resolution cone beam computed volumetric tomography (CBCT) unit in our office. This small field unit, the first in the region, provides three-dimensional radiographic images of the teeth and jaws that can be spatially manipulated on a computer and viewed from any angle, allowing greatly improved viewing of orofacial structures. While a thorough history and clinical examination are essential for the diagnosis of odontogenic pain, interpretation of periapical radiographs (PAs) is complicated by the background pattern of overlapping roots and anatomic structures such as the maxillary sinus and the zygomatic buttress. The use of computed tomography (CT) enables the evaluation of the true extent of lesions and their spatial relationship to important anatomic landmarks. Currently, we are recommending taking CT images for most retreatment and surgical procedures, in diagnostically challenging cases, in cases where a complex root canal anatomy is suspected, resorption cases, and when we are treating procedural accidents. On occasion, scans are taken mid-treatment to help locate difficult anatomy. Radiation dose to the patient is another benefit of CBCT imaging. While a medical CT image of the maxilla and mandible is about 2.0 mSv or the equivalent of 243 days of background radiation, a small field CBCT will require only 0.005 - 0.038 mSv or the equivalent of 1 - 5 days of background radiation, depending on the area of interest. We hope that we may be of service to the patients who may need evaluation of their dentition to rule out odontogenic pathosis.